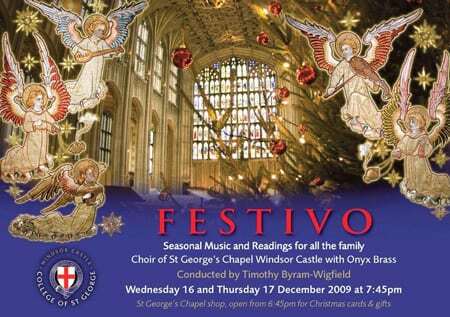 FESTIVO this year takes place at 7.45pm on Wednesday 16 and Thursday 17 December and will include seasonal music and readings for all the family. John Rutter’s Gloria is the centre piece for the concert, scored for mixed voices, brass, organ and percussion. Amongst other works will be the 14th century carol Resonemus Laudibus arranged by Sir David Willcocks, a Chester Lullaby by Patrick Gowers and three movements from Britten’s Ceremony of Carols. Onyx Brass will be performing as a larger ensemble for Gloria and the carols for audience participation, besides entertaining us in its familiar guise as a Brass Quintet. Do come and join us for these special evenings of words and music in the unique setting of St George’s Chapel, Windsor Castle. A ‘Concert Goers’ Reception is again to be held in the Vicars’ Hall at 6.45 – 7.30pm with hot and cold canapés, mulled wine and warm mince pies; all profits will support the music at St George’s. Click here to download the Ticket Order Form Please note that for both evening performances, Zones A, B, C and D are now sold out (16 Nov 2009). 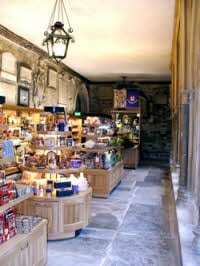 The Cloister shop will open before the concerts and during the intervals. Why not take the opportunity to find a Christmas gift from this one off shop with many exclusive lines.